Apple (s aapl) has been steadily improving the iPhone’s photo taking abilities with each new iPhone it offers. This is true of the hardware components on the device that make up the camera as well as the software that makes use of the camera. While the new iPhone 5S certainly has some impressive new capabilities due to improvements in hardware, iOS 7 has also been enhanced and makes taking, editing and sharing photos a better overall experience for all supported devices. 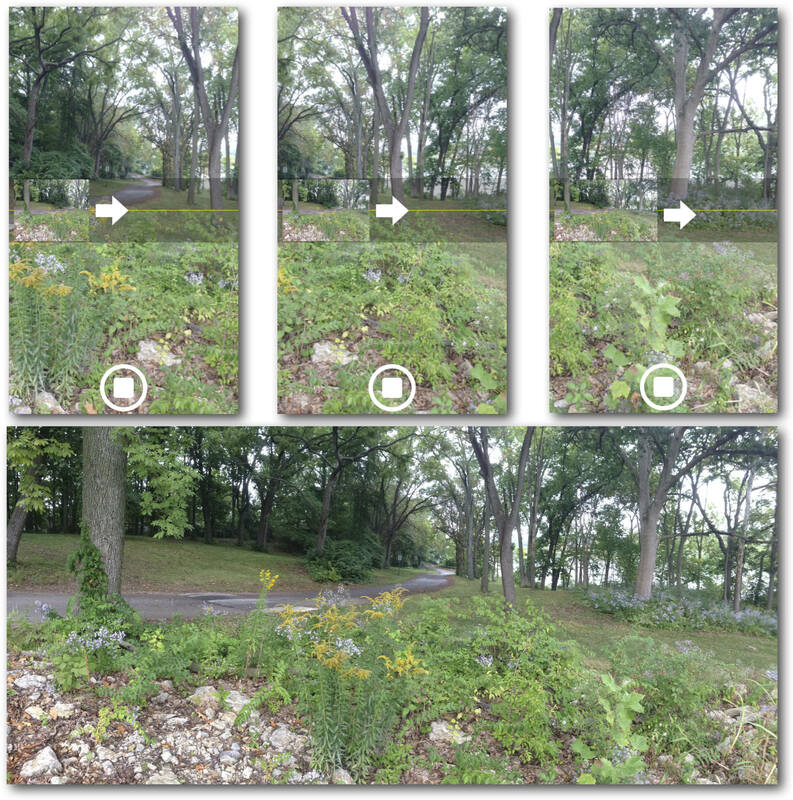 More accessible than ever before, Apple’s Camera app in iOS 7 has a few new features to get excited about. You can access the Camera app from the app’s icon on the home screen as well as by swiping up on the camera icon from the lock screen. It is also accessible from just about anywhere by tapping on the camera button in the new Command Center. You can even still use the volume controls to snap photos. A new square photo mode has been added to the existing video, photo and pano modes. If you happen to have an iPhone 5s, you will also see the new Slo-Mo mode that lets you film at 120 frames per second. When set to either the square or photo mode, there is now a button that resembles three overlapping color filters. Tap it and you will see nine frames arranged in a three-by-three grid. 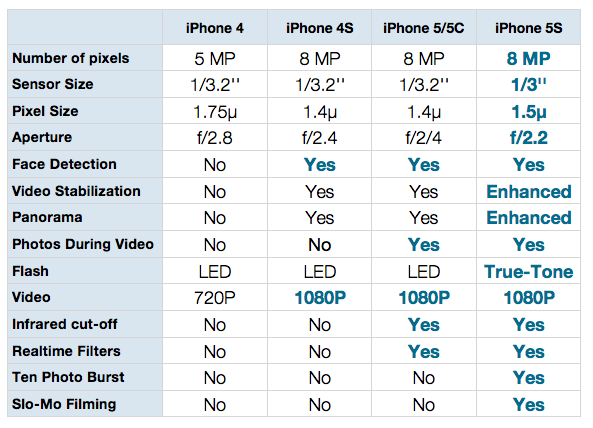 With the iPhone 5, 5C and 5S, you will see in real time how the different filters will be applied. They are Noir, Chrome, Instant, Tonal, Transfer, Mono, Fade Process and of course None. Tap and hold the shutter button and the iPhone 5s will take up to ten pictures a second in burst mode. Low light photos will look better on the iPhone 5s as well with its enhanced image stabilization and a new technology that will merge the least blurry parts of four photos into one. 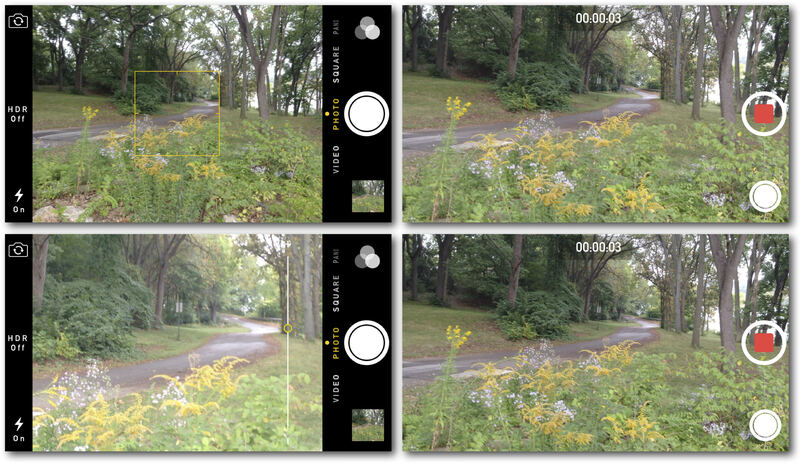 The same is true for panoramas, as they will now shoot at 30 frames per second and adjust the exposure while you pan across the scene you are shooting with your iPhone 5s. The Photos app is still the fastest way to access the photos you have on your iPhone. 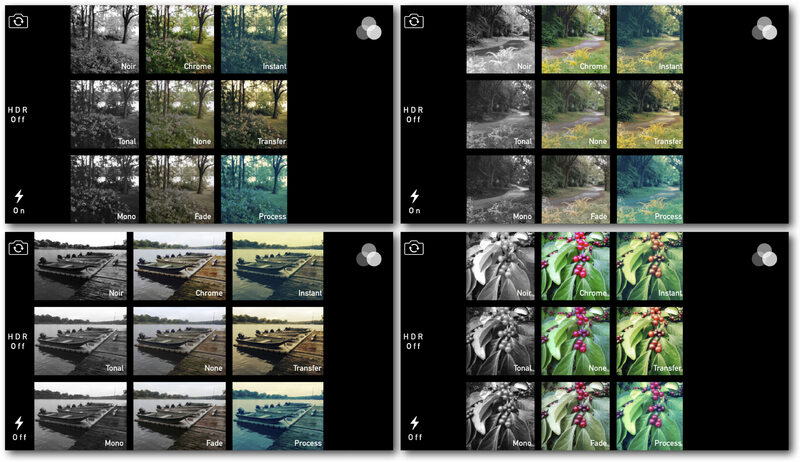 Of course the photos you take with the built-in Camera app will appear in your Camera Roll, but with iOS 7, third-party apps can now save photos to a specially named album like an Instragram or a Diptic. This only works if the third-party app takes advantage of this new feature. Other new photo organizing features include a drill down from years to collections and finally moments. Collections can be from a certain location over a range of dates, whereas moments are photos taken at specific locations on a specific date. These new organizations also include photos from your shared photo streams, but not from others’ shared photo streams. 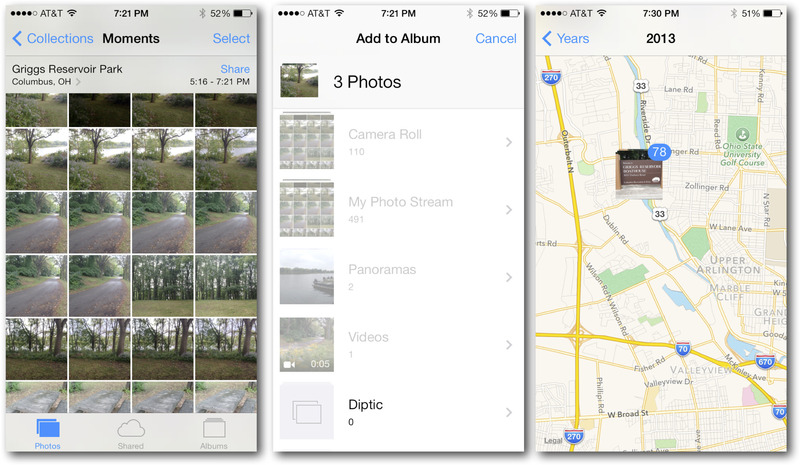 iCloud’s Shared Photo Streams, accessible from within the Photos app, have also been updated with the release of iOS 7. 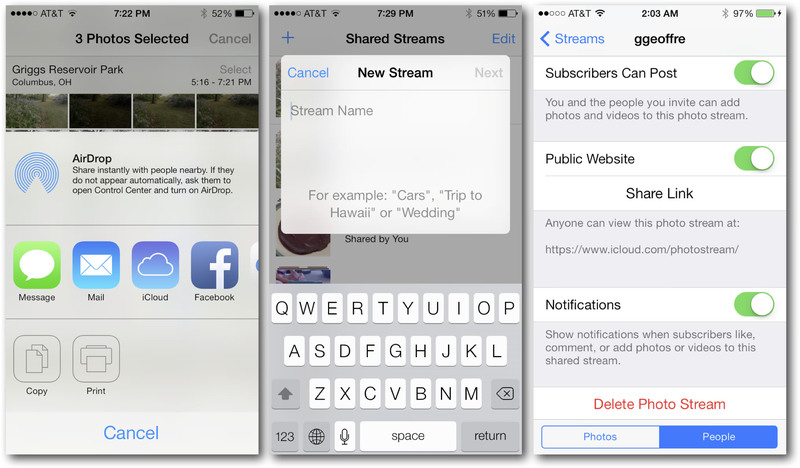 You can now share videos on your Photo Stream as you do Photos. Additionally other iCloud members that you have invited to your Shared Photo Stream can now post their own photos and videos to your Photo Stream. This makes it very easy to set up a single shared event Photo Stream that everyone can post too. The other big change to Photo Streams is that you can now open up your Photo Stream on iCloud.com to anyone, even friends and family that do not have an iCloud account. Once your public iCloud Photo Stream is live, you can even share a link to the site with your Twitter and Facebook friends from within the Photos app. In addition to iMessage, Mail, iCloud, Twitter, Facebook and Flickr photo sharing options, iOS 7 has added AirDrop support to the Photos app. AirDrop is a way to quickly share files between devices. Not all devices that are capable of running iOS 7 support AirDrop; only the iPhone 5, iPad 4, iPad mini and the 5th generation iPod Touch. To get AirDrop to work, both devices must have both Wi-Fi and Bluetooth turned on. Additionally you need to establish exactly who you can share with: no one, everyone, or only individuals you have in your contacts. Unfortunately the iOS implementation of AirDrop is not presently compatible with the OS X implementation of AirDrop, something that will hopefully change in the future. 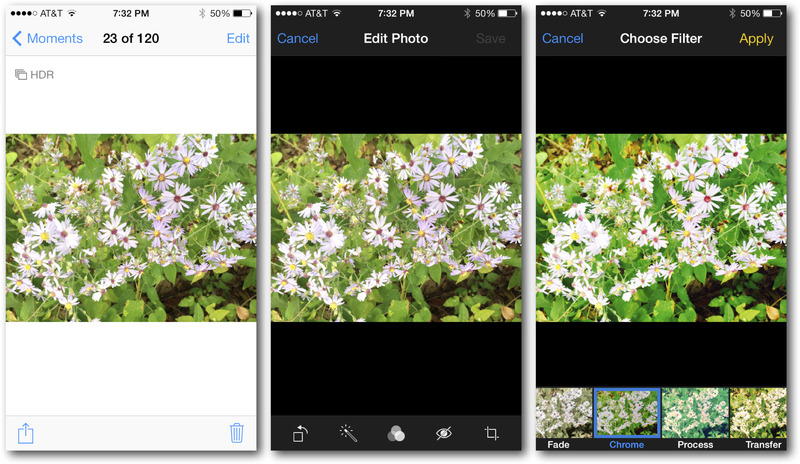 With the Photos app you can also make some simple and quick edits to your photos. Cropping, rotating, removing red-eye and auto enhancing are still there, plus the new ability to apply the same collection of filters available to the Camera app: Noir, Chrome, Instant, Tonal, Transfer, Mono, Fade and Process. For videos the only option you have to edit your videos is to trim them. For advanced photo and video editing capabilities, you will need to turn to Apple’s iPhoto and iMovie editing apps. When Apple announced the availability of iOS 7 and the two new iPhones, the 5c and 5c, Apple also announced that all new iOS device purchases will include a copy of iPhoto and iMovie. From this point forward, these apps will forever be part of the standard apps that come with your iPhone, iPad and iPod Touch experience. Just like they do on OS X with every Mac you purchase. The editing capabilities of iPhoto are much more advanced than those included in the Photos app. Beyond the auto enhance feature of the Photos app, iPhoto gives you control over the photo’s contrast, brightness, and color saturation. There are even controls to enhance the green in scenery, the blue in skies, and hues in skin tones. Taking enhancements one step farther still are Brushes. For example, with Brushes you can selectively saturate or desaturate, lighten or darken, and sharpen or soften each photo by painting a selected area within the photo. You can even straighten images by as little as one degree rather then rotating the photo a full 90 degrees. If your particular iOS device does not support the new AirDrop feature of iOS 7, there is a feature in iPhoto that you can use instead. 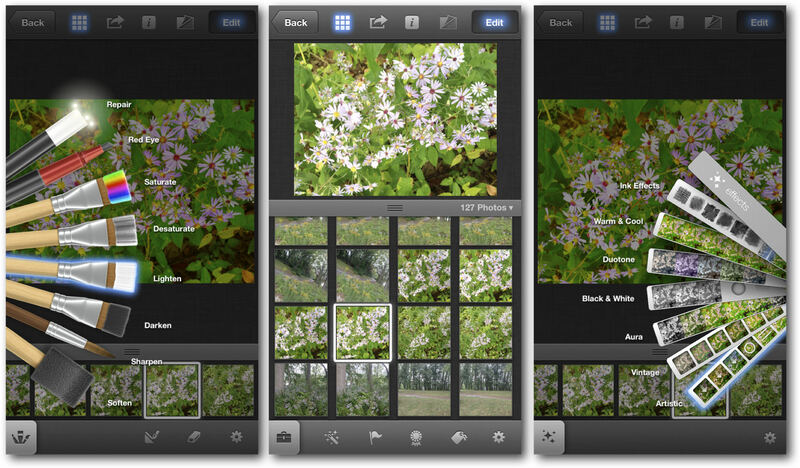 iPhoto has implemented Beam as a means of sharing photos between iOS devices. From within iPhoto you select the photo or photos you want to share with another iOS device and tap on Beam instead of Facebook or Twitter. Provided iPhoto is installed and running on the other iOS device, the photo will then be sent. This is a great way to take better photos with the camera on your iPhone, then edit them with the larger screen on your iPad. In contrast to iCloud’s Shared Photo Streams, where you post individual photos online in one continuous stream, iPhoto has a Journal feature where you can personalize a collection of photos into a story. Journals in iPhoto allow you to arrange your collection of photos in a series of pages, each page having its own title and heading. 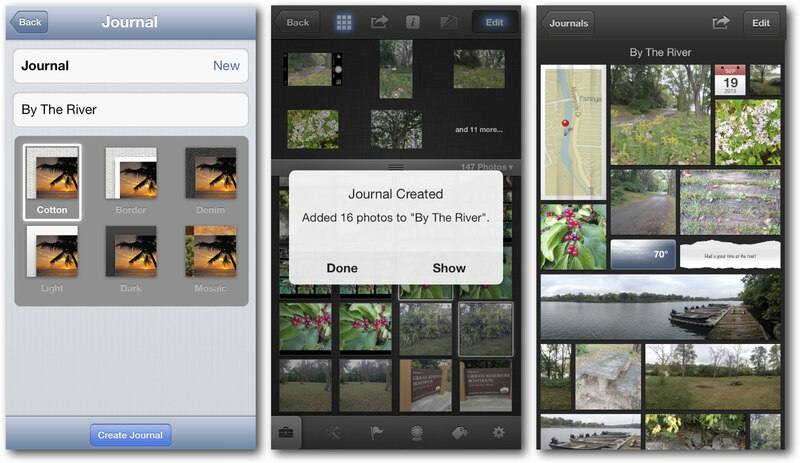 You can also add non-photo elements to your Journal like notes, comments, weather, calendars and maps. When you are finished, you can then publish your Journal to iCloud and share the link with your family and friends. Now that iCloud supports sharing of movie files in your Shared Photo Stream, you can share each individual movie you take instantly with just about anyone. There are however times when you will want to do more than just trim individual movies in the Photos app. And that is where Apple’s iMovie for iOS comes into play. 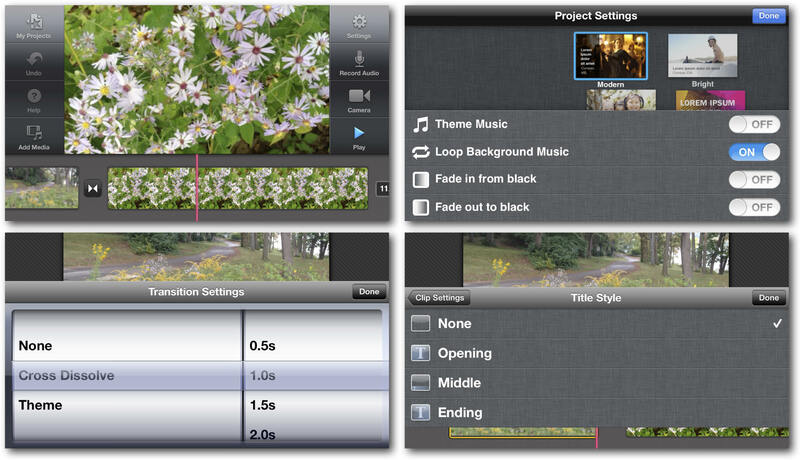 iMovie will allow you to piece together several different videos you have taken with the Camera app. You can add title sequences, photos and music to your movies as well. 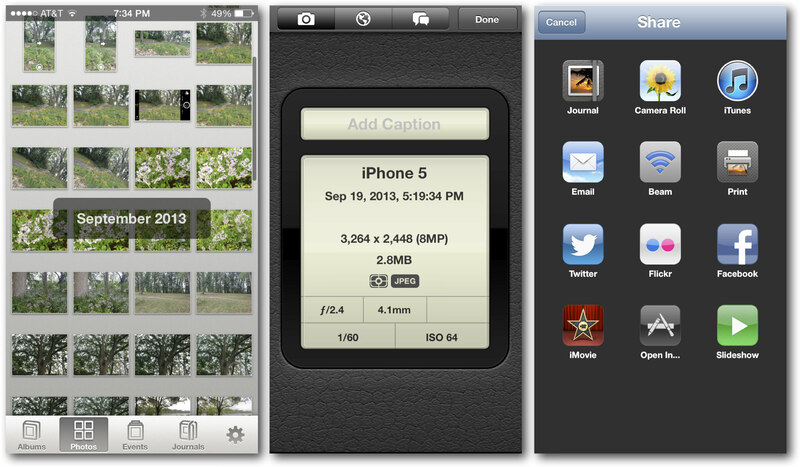 It even has the ability to implement transitions between different clips and photos. Once you have finished edition your movie, you can share it online for everyone to see. With the release of the iPhone 5S’s new camera, iOS 7’s enhanced photo apps, and the inclusion of both iPhoto and iMovie with every iOS device purchase. Apple has raised the standard for both mobile photography as well as cinematography. Now anyone can accomplish a whole lot more from the first moment they take their new iPhone out of the box. Sherrie – hi. To save a photo from a message– tap the photo once. The photo should then be shown full size after moving to another screen. Tap the ‘share’ icon at the top right hand corner (small square with an arrow out the top). This then opens up another screen with options . Tap the ‘save image’ icon and your photo is saved in your photos app. Hope this helps. To add a photo to your txt –there iis a camera icon next to where you start typing your msg (opposite the ‘send’ icon. Press the camera icon and options of ‘take photo or video’ and ‘choose existing’ appear. I’m sure you can do the rest. How do I save a photo from an iMessage someone sent me? The upward arrow only has forward capabilities now. Hi Sherrie-your answer is below from me Tommyt. Hope this helps you. Hi Sherrie–to save an image from imsg– give the photo a quick tap (do not press ). Your photo should open up in full screen. At the bottom right of the screen is a faint blue share icon which looks like a box with an arrow out the top. Press this and a list of options including ‘Save image’ appears. Your photo is saved to your photo app. i cannot access my photos from social apps (whatap viber etc). i have tried setting-privacy-photos option, but there is no toggles to turn on. its a blank screen there..
Hi Elliot. Go to the photo in your photos app that you want to send as an e-mail. Tap the photo once to view it full size. At the bottom left of the screen is your share icon (a square with an arrow out the top). Press this and it opens up an option screen where you should see the ‘mail’ option. Tap the mail option which opens up a mail page with the photo attached and waiting on you filling in the recipients mail address and subject etc. so the trick is to go to the photo first– not the mail app. Hope this gets you mailing ok. I don’t see Beam anywhere on my iPhone 5 with iOS7. Hi Mat — your answer is down below under one of Tommyt’s posts. Hope this helps. I used to take a pic on my iPhone 4S and I could find it in my ipad. I no longer can find the pics on my ipad since iOS7. Please advise, what am I doing wrong??? Hi Jillb1118–further to my answer I posted about your photo sharing problem . As well as making sure on your pad that icloud is switched on in ‘settings’ and ‘photos’ is switched on. In ‘settings’ scroll down till you see ‘photos & camera’ –tap this and then you will see options to switch on your photostream and photo sharing. Hope this helps. I have developed eSharing, an app that lets you send photos and videos indefinitely and without breaking the videos. As son as possible i’m goig to add full support for Dropbox. Try it http://esharing.us and give me some feedback please. with Iphone 4S IOS7, how do you trim a video ? Since updating my ipad to ios 7 my facebook camera wont rotate to the way I hold my ipad! Weird! Any suggestions would be very much appreciated. Hi Joe Tullock-about your rotation problem. Joe you may have activated the rotation lock switch which is next to your volume control rocker switch on the side of your pad. You can disable this switch to prevent further accidental locking by going to ‘settings’ then ‘general’. You will see an option for rotation lock. If it is ticked–untick it to disable the switch on the side of your pad. It may not be the cure but its worth a try. Hi Joe Tullock–forgot to mention– there is also a rotation lock in your control screen which you pull up from the bottom of your phone screen. Its at the top right hand side of the grey pull up screen. It shows a circular arrow with a padlock inside. Tap this to lock or unlock portrait orientation. No way to text a picture without closing the camera completely out and restarting it! The icon for texting / emailing etc does not show in the bottom left corner unless you shut the camera completely down and restart it? Hi RobfromVA. After taking your photo -tap the square photo screen next to the shutter. Your photo appears with the share icon down in the left corner. Tap it and your photo appears with a tick and a set of options. Tap the message icon and your message page opens with the photo included. After you send your message press ‘done’ and it takes you back to the camera. I used to tap a photo in camera roll then it was easy to email from there. Can’t find that feature in IOS7? Can you help? I have ios7 and don’t have any problem sending photos. You don’t see a box icon at bottom left with an up arrow inside of it?? MY problem is that I can’t figure out how to delete “collections”…… Anyone?? Hi Christine – the idea of ‘collections’ is as the name implies. It’s a page to store all your photos as one collection. If you want to delete anything included in the collection stay on the ‘moments’ page. There as you scroll up and down you will find your photos grouped into years-months-weeks or days. Tap the ‘select’ option in blue at the top right hand side of the page. Beside each group of photos is another ‘select’ option. Tap this and the photos end up with a tick in each of them. You can untick the ones to save or leave the ones you want deleted ticked. At the bottom of the screen on the right side you will see the bucket (delete) icon. Press this to delete the photos you have left ticked. Make sure the ones you want to keep are ‘unticked’. Hope this helps you. nre Ios 7 crashed my facebook page and facebook app when trying to add photos from the camera roll. Is the camera roll, or the apps> Did a hard boot, nothing. Reinstalled apps..still crash. My 4S phone with the new iOS will not allow me to post pictures to facebook or my facebook page from the app. When I try to add a photo the app crashes. try a hard reboot, deleted the apps and reinstalled them..still camera roll crashes the apps. Hi advgrrls–check in the app store that the facebook app has been upgraded to run on ios7 and is compatable with your 4s. Usually when an app crashes it has not been updated to the latest version. So check compatability for your older 4s and ios7. The facebook app should have been updated by now. Hi advgrrls–checked the reviews of the latest update to the facebook app in the app store and it seems your not alone with the crashing problem. Many people are reporting the same issues. Hopefully Facebook will sort it out with a small update for the app. Where can I see the photo I saved from facebook to camera roll??? It still give the option to save the photo but with new ios7 I cannot find it in moments or year or whatever!!! Please please can Anyone give me an answer……struggeling with this 6 days… Many hours……going CRAZY!!! When I hit save on a photo in an e-mail where is it being saved? I can’t figure out how to forward a picture in an e-mail by using a text. Hi Francisco– if you receive a photo in an e-mail–once it has opened so you can see it in the mail. You don’t tap the photo-you press your finger on the photo and a list of options opens up. Press the save option and your photo is saved in your photo app. To send the same photo in a text you go into your photo app and tap the photo you wan. Once it opens press the very small and faint share icon (a box with an arrow sticking out the top) down in the left hand corner of the screen which opens up your options for sending. Hope this helps. If I turn off photo stream (which seems to put photo’s on every and all devices so it is really hard to manage my photo’s) will it delete any/all of my (saved to the cloud) journals? Hi Kathy–I answered your question but put it in an answer to Cindi by mistake. It should be there somewhere. I can’t text a photo either! So annoying! What am I missing? It was so easy prior to IOS7. Hi Cindi — any photos that arrive on any of your devices ie-phone -ipad or itouch etc by photo stream will be deleted when you switch off photo stream on the device that you don’t want any more photos to be streamed too. Before you switch off photo stream on that device you should save any photos you want to keep to camera roll. Please make sure you do this before switching off photo stream on the device you don’t want photos delivered to any more. The device which originally took the photo will have that photo saved in its camera roll. So save any photos that you want to keep into your camera roll before switching off photostream. I cannot get my Photos to rorate, flip.. period..any resolution?? Hi Lee –I find if you are looking at a photo that should be viewed in portrait view and you are holding the phone in landscape view. The photo will rotate only when you turn the phone so the large home button is at the bottom of the photo. The phone doesn’t seem to want to rotate the photo if the phone is upside down (large home button to the bottom). Or tap the photo and tap edit from the options. The rotate option is to the bottom left of the edit screen. Lee-further to my last post about your photo rotation problem. In the control screen which you pull up from the bottom of the phones screen–there is a rotation lock at the top right hand corner of the grey screen. The icon consists of a circular arrow with a padlock inside. Tap this to switch rotation on or off. I updated my 5 this weekend and now I can’t send a photo… the icon to email or text it has vanished !! How do I email or text a photo ? Hi Greyskunk-the answer to your problem is in one of Tommyt’s posts. Hope this helps. Am I crazy? I am holding it down and no options pop up…I cant get it to work! My question exactly. Where did “save to camera roll” disappear to? How do I get photos from iMessage into my camera roll now? Yeah, I’m searching for this exact answer?! To Jillb1118– have you enabled icloud in your ipad. In the icloud options you may have the photo saving option turned off. Have you also set up your ipad with the same account as your phone ??. Hope this helps. Hi Jo -forgot to mention– if you are using ios 7 the photo you cropped and thought you had lost is still there. Open up your cropped photo and tap ‘edit’. Tap the cropping option at the bottom of the screen (which you must have done before) . When the grid appears pull the corners out to expand the photo. You will see your original photo appear again. Keep pulling the corners of the grid out till you have your original snap again. Press ‘crop’ then ‘save’. You now have your original photo back. The same applies to when you add a filter to your photos. If you want to go back to the original just go to the ‘edit’ ‘filters ‘ option and press ‘none’ in the list of filter options. I must start charging for this service lol. There is a photo sharing app called “Pokee” (http://pok.ee) which does the same like this. I really like the idea, but the pixels are kinda crazy, 720p video is awesome. PS: Feel free to remove this link if its not allowed, I just wanted to give you some tips. The iPhone 4S *did* support true 60 fps video at 720p in 3rd party apps, until Apple disabled it in a subsequent version of iOS. Sean-Hi. As yet you cannot share or send the ‘slo mo’ video you create. It will be sent as a ‘normal’ video. I will try to explain. Normal video is recorded at 25-30 frames per second and will play back at normal speed in your computer-phone-dvd player or any other software you use. To view this ‘normal’ video in slo-mo the player or software you are using must have a slo-mo option built in to it to play the ‘normal’ clip in slo-mo. So all Apple has done with the 5s is build in the capability to play back ‘normal’ videos in slo-mo. the slo-mo effect is only a built in playback option. They could have included a fast speed option too but the clip wouldn’t last long. The reason the clip is recorded at 120 frames per second is to give smooth playback in slo-mo. if you were to play back a clip recorded at 30 frames per second in slo-mo it would be very jerky and unwatchable. The slo-mo effect you create is not embedded or saved in your clip. The phone or any other device you have with a slo-mo playback option is only giving you the chance to see life in slo-mo thanks to the 120 frame rate rather than 30. So for now its a novelty-but an excellant one.